North Carolina Gov. Roy Cooper warned that the state anticipated the storm could cause up to 500,000 power outages. A winter storm unleashed snow and freezing rain on large swath of the southern United States Saturday and threatened to bring treacherous conditions to the East Coast. Approximately 25-M people in 13 states could be impacted by the snow and rain. Across the United States, nearly 600 flights were canceled and more than 8,300 were delayed, according to flight tracking website Flight Aware. A state of emergency was declared in North Carolina and Virginia as the winter storm, which was over parts of Texas, Oklahoma, Arkansas and Tennessee as of Saturday afternoon, continued to head east. North Carolina Governor Roy Cooper warned that the state anticipated the storm could cause up to half a million power outages. “Tonight and tomorrow, it’s time to hunker down and stay safe … this weekend is not the time to see a winter wonderland,” Governor Cooper said. Along the southern side of the storm, flooding was a concern in warmer states, from southeastern Texas to parts of Georgia. 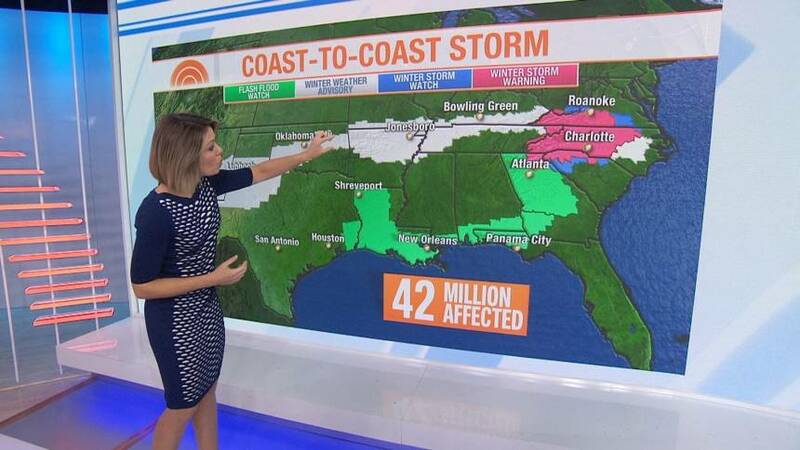 Approximately 14-M people were under winter weather advisories across the southern and eastern United states. Winter storm warnings were in effect along the northern side of the storm, including in parts of western North Carolina, southwestern Virginia, upstate South Carolina, eastern Tennessee, southern West Virginia, and northeastern Georgia, according to the National Weather Service. Prior to moving east, the storm had already dropped several inches of snow in southern states. In Lubbock, Texas, approximately 9.5 ins of snow had fallen as of 9:00a CST Saturday, according to the NWS. The Texas Department of Transportation warned travelers to drive with caution, and advised people to stay home if possible. In other parts of Texas, flood watches were canceled following heavy rainfall from the storm. Stay safe, warm and dry.